After the successful launch of TRADINATOR earlier this year, TRADOLOGIC is now introducing TRADO-BAR – another type of land-based solution with implemented games. TRADO-BAR is the latest innovation powered by TRADOLOGIC. This is a new generation, land-based terminal for financial entertainment similar to the earlier introduced TRADINATOR. However, TRADO-BAR has much smaller dimensions and supports a touch screen instead of a button board. This makes the machine even simpler to use and more entertaining. One of the main advantages of the product is the adjustable touch screen monitor. Furthermore, the design of the machine makes it easy to install, thus applicable for a wide range of locations including business offices and Trade Rooms. 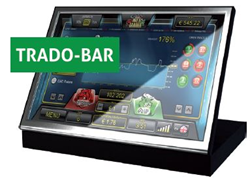 TRADOLOGIC has developed a variety of games to be integrated in TRADINATOR and TRADO-BAR. These are Markets Rally, Crazy Markets, Wild Trader, Bull and Bear, FOREX Gump. The games are based on Turbo and Super Turbo binary option and deliver an exciting trading experience. Currently, three of the games are available online to be integrated in existing gaming websites. TRADOLOGIC’s software brings new excitement to the players and gives them the chance to embark on a unique gaming journey. For more information about TRADINATOR and TRADO-BAR please visit http://www.trade-floors.com. TRADOLOGIC is an award-winning software provider for binary options trading to the financial and gaming industry. TRADOLOGIC’s team pioneers in the binary option trading field and possesses a first-hand insight and deep knowledge about the financial trading industry. Currently, the company offers its clients a variety of products including option types, trading tools, advanced features, integration solutions and services that deliver outstanding trading experience and optimized user value.